After connection with MyFtinessPal, Accupedo will automatically sync with MyFitnessPal every 30 minutes. If Accupedo does not sync with MyFitnessPal, please uninstall the MyFitnessPal app and reinstall it, then try to connect it from Accupedo. It should work. You do not lose your MyFitnessPal data. If Accupedo still does not sync with MyFitnessPal, please do the following test and let us know of results. 1. Can you open MyFitnessPal app, and check if you can see Accupedo step counts with progress bar? 2. Can you open Accupedo app, and go to MyFitnessPal window? Please check Last synced time. Does it show recent time or null ? 3. Please click "SYNC NOW" button from Accupedo app. After that, open MyFitnessPal app, and check step count is synced. It takes several minutes to update and sync. 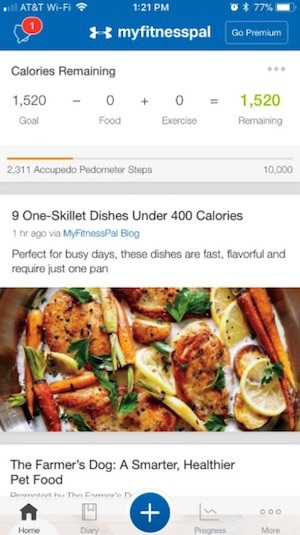 You can manually update it by going to MyFitnessPal's menu, and go down to the bottom. You will see "Sync" menu. 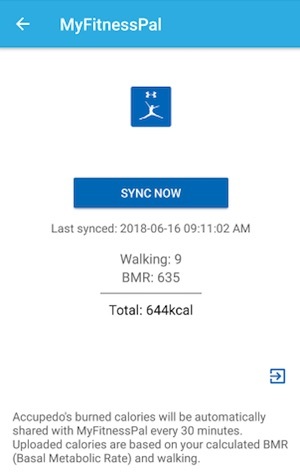 Click "Sync" menu, and check step counts.